I interviewed hundreds of women—from Algeria to Zimbabwe and 57 countries in between—and discovered that, no matter where they are from, women everywhere want the same, universal things. Women want to be educated about how to protect their own health. 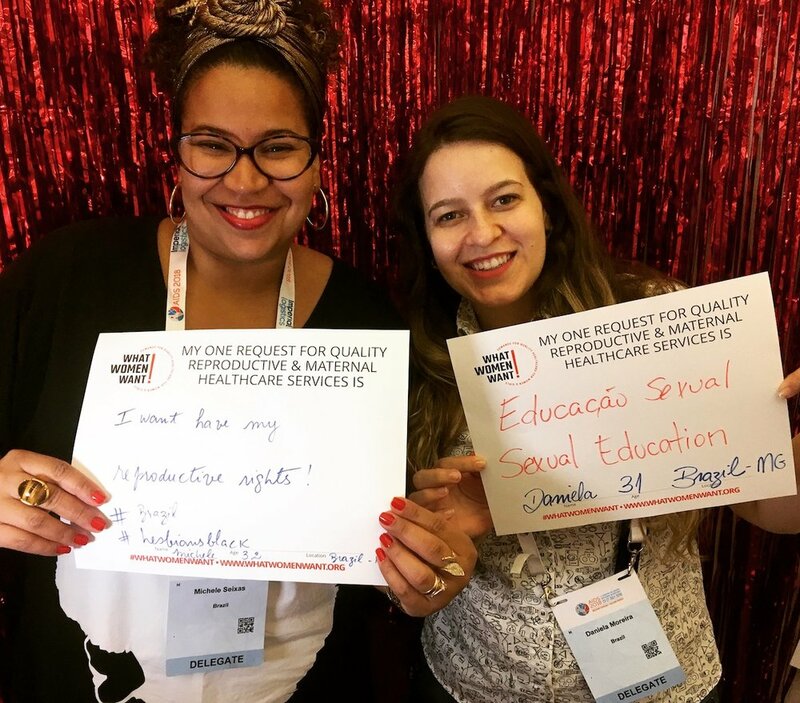 At the What Women Want message wall and photo booth, we asked women to write their number one demand for quality reproductive and maternal healthcare. We’d then stick their message to the walls of the booth. As the days of the conference passed, the wall filled up and the messages stood five to six layers deep. 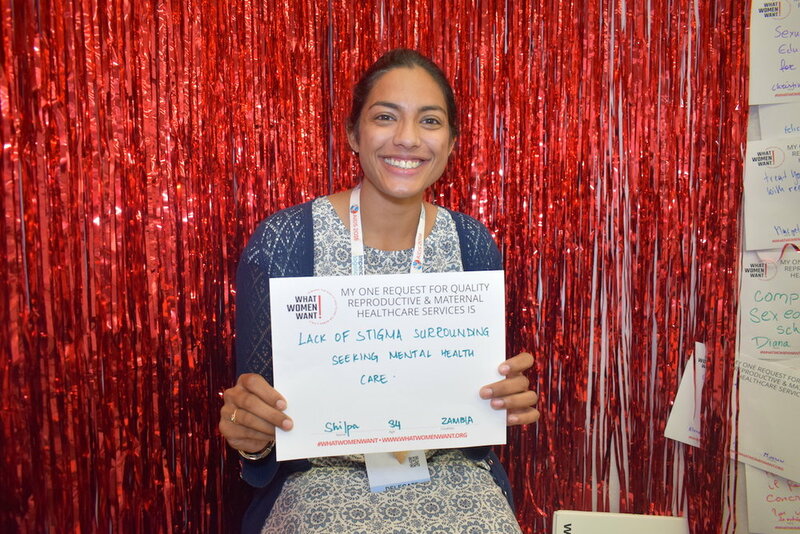 The chance to freely share their requests for quality healthcare made the What Women Want booth a hub of activity. Countless conversations were started between strangers as they reflected on how similar their healthcare demands were, even if they came from countries that on the surface seemed so different. It was overwhelming how many women asked for better sexual and reproductive health education. The demands were as varied as the simple request for “sexual education” and “access to education for vaginal health” to the need to be able to access information on healthcare and be supported in using that information to protect their own health. What can you do to protect yourself from harm when there is nobody there to help you? The only way to break through these barriers to care is the universal empowerment of women. I was helped at the message wall by an amazing woman named Irene Nkosi, a Mentor Mother from South Africa working with Mothers2Mothers, a What Women Want partner, to help educate HIV-positive mothers on caring for themselves and their children to prevent mother-to-child HIV transmission. She has dedicated her life to making sure that women in her community are given a voice and are educated and empowered to protect themselves. 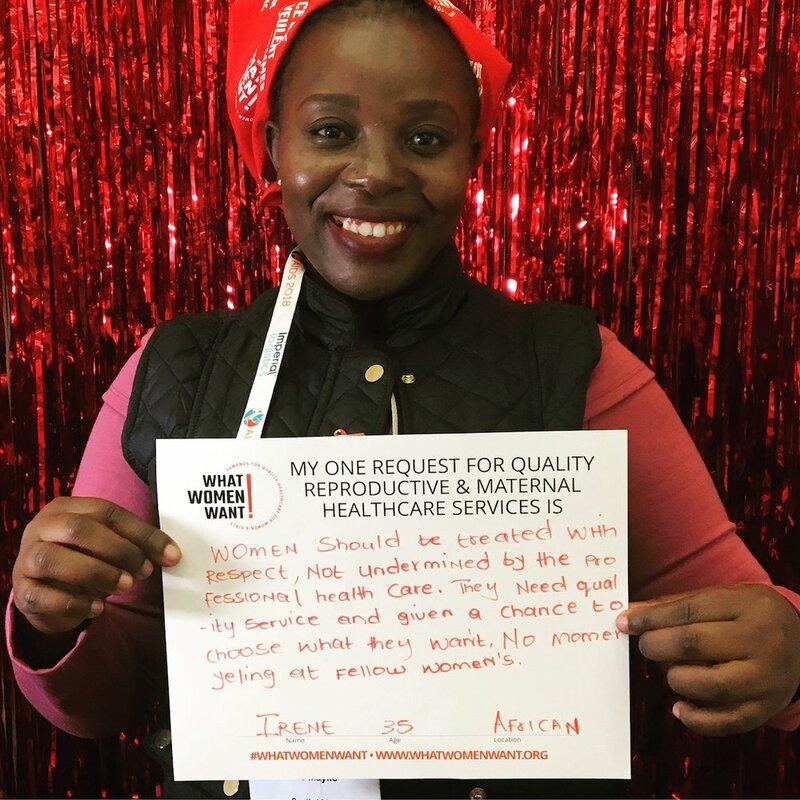 The world needs more women like Irene Nkosi—strong, confident women demanding their right to quality care. Women want to be trusted to make their own decisions about their healthcare. Women deserve to be treated with respect and trusted to make their own healthcare decisions. In some countries, a woman requires approval from a male partner before being able to receive the care that they need—or want. Even if you have never needed a male relative to sign off on your healthcare plans, you’ve probably experienced the trauma of feeling undermined by those, including doctors, who believe they know best for you. I spoke to dozens of women who told me about their years-long battles with their doctors over long-term birth control options. A woman from the Netherlands whose request is “the right to choose my contraception free from negative pressure or discrimination.” She was in her mid-twenties, and her doctor refused to give her an IUD. Her sign on the What Women Want booth wall became a space to share stories of other times when doctors refused to listen to women about their reproductive plans. A young woman from Canada told me that her friend was unable to take hormonal birth control for health reasons but had been refused tubal ligation throughout her twenties because her doctor kept saying, “you’ll want to have children someday.” She ended up having seven abortions by the time she was 31—a “terrible cycle” that her doctor seemed unwilling to end, believing he knew more about her future than she did. Women want access to quality healthcare. Have you ever had a hard time getting in to see your doctor? Has it taken weeks of waiting to see a health worker to discuss an issue that matters to you? What happens when you finally see the doctor? Are you treated with respect? Or, like some of the women I spoke to at AIDS2018, do you feel mistreated and shunned? So many women asked for “stigma-free health services” and to “be treated with respect.” A woman told me that her doctor refused to be alone in the room with her because of her HIV status. Another said she has felt such shame when speaking to her doctor that she avoided regular check-ups. The stigma around seeking mental healthcare is universal. Shilpa Iyer, a researcher currently located in Zambia, has seen this stigma translate into “women having unequal power and relationships” and being “treated like second-class citizens” in her home country of India, but also in Zambia and the United States. When women are empowered to seek and receive the healthcare they need, they can build a future that they, their family, community and country can benefit from. Women want their voices to be heard. From being able to access sexual health education, to receiving contraception that fits their needs, to being treated with respect by their doctors—women everywhere want to be listened to. The very last day of the conference, as I was packing up the booth and getting ready to return home, a young doctor from Zimbabwe was stopped in her tracks by the messages she was reading on our wall. She asked to learn more about the campaign and told me that she had never actually stopped to think about listening to her patients—because she was the doctor, and she knew best. When I told her about a woman who had stopped taking her antiretrovirals because the formulation made her gain weight in her stomach and lose weight in her hips, adding to her feelings of shame and unhappiness over her HIV status, and how her doctor didn’t take the side effects seriously for an entire year, she was shocked and reflected on whether she had ever treated a patient that way. The power of the What Women Want campaign is that women are being given a chance to openly discuss their healthcare needs—and we’re making sure that doctors, health practitioners and global health organizations are going to listen. It’s the only way change will be made and lives will be saved. Older PostMore Than 300 Partners Want to Know – What do Women and Girls Want Most When It Comes to Quality Health Care?